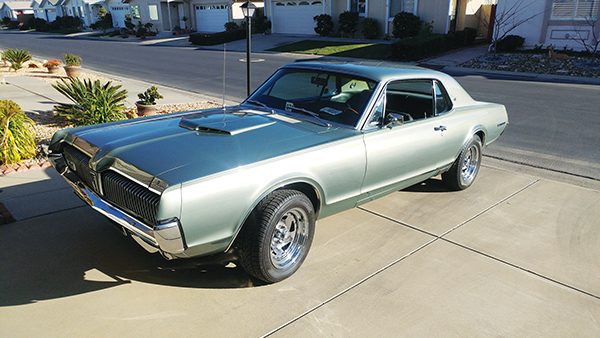 The International Mercury Owners’ Association welcomes George Woehlke from Santa Maria, Calif., and his 1967 Mercury Cougar XR-7. He is one of three founding members of Mercury Stray Cats – Central California. George is the MSC Central CA’s top active car show member, having participated in the most car shows, including but not limited to St Patrick’s Day Santa Maria and Warbirds Paso Robles Fullerton SCCC. George has been promoting the need for a Mercury Cougar class at all shows. George shares his story: “My first car I ever owned was a 1957 Ford Fairlane 500, which I purchased for $275 when I was 17 years old in 1966. I owned this car until I was drafted in 1968. My sister’s girlfriend had a 1968 Mercury Cougar. She would allow me to drive it and that is when I decided to buy a Cougar when I got out of the service. Unfortunately, when I was discharged in 1973 from the USAF, I spent two to three years going back and forth to the Veterans Hospital in Los Angeles, having surgeries for injuries that occurred while I was in the military. I got married and my thoughts of owning a Mercury Cougar went to the wayside for many years. 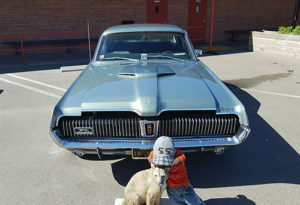 When I separated from my wife in 2001, I started searching for my dream car, a 1967 Mercury Cougar. After several long years traveling through the good old USA, I decided to find one locally because I could not afford to travel in order to see one-sided Cougars (one side looks good in the picture, the other side is all messed up). George was living in an apartment then, so he made arrangements with the manager of the apartment complex to lease another spot so that the Cougar would be covered from the weather. “I would work on the car on my days off from work from sun up to sun down,” George said. While fixing the little rust on the car, he decided to have the car stripped down and repainted. He chose that color because he wanted to help show off the interior of the car. 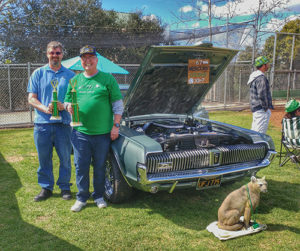 Author Rob May (at left) and Cougar owner George Woehlke celebrate awards they were given at a recent car show. A friend of his named Kevin owns a shop called Mustangs Limited in Arroyo Grande, Calif.
Kevin then pointed out that rebuilding the engine would cost way more than a new Crate engine (there were no guarantees on the rebuild of the original engine, which was a 289). George enjoys driving his Cougar at least once a week or more, driving in luxury and comfort (like riding in a Lincoln with comfortable luxuries and being safe). 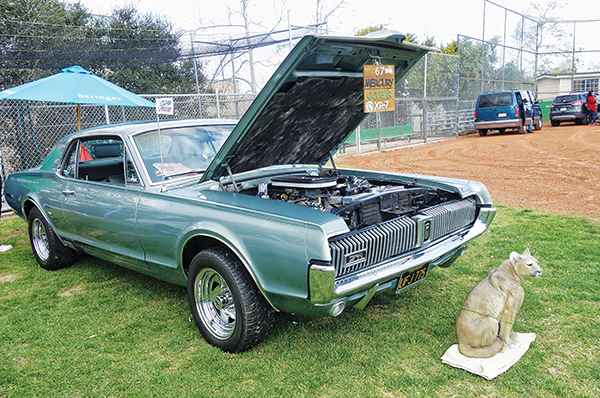 Next up is the All Ford Orcutt California Sept. 8 event, with a newly added Mercury Cougar class. Also, Mercury Stray Cats Central CA hosts Mercury Cougars, Comets and Cyclones on Saturday, Oct. 6, at the Radisson in Santa Maria, Calif. This is an all Mercury event – any and all condition Mercurys are highly encouraged to join us! Images for this story provided by Georgina Garcia May and George Woehlke.